Apex tap holding sockets, male hex drive have hex tolerances that are on average 48% tighter than DIN and 35% tighter than ANSI requirements. All Apex tap holding sockets have the tightest tolerances for straightness and concentricity in the industry. Quality design and construction give Apex tap holding sockets a long service life and durability. Apex tap holding sockets are not to be used with impact drivers. The SJ-935-1/4 Apex Brand Taping Holding Socket, Male Hex Drive is one of thousands of quality tooling products available from MRO Tools. Please browse Apex Tap Holding Sockets, Male Hex Drive, SAE for tools similar to the SJ-935-1/4 Apex Brand Taping Holding Socket, Male Hex Drive. SJ-935-1/4 Apex Brand Taping Holding Socket, Male Hex Drive description summary: Tap holding sockets, male hex drive from Apex Tool Group, formally Cooper Tools. 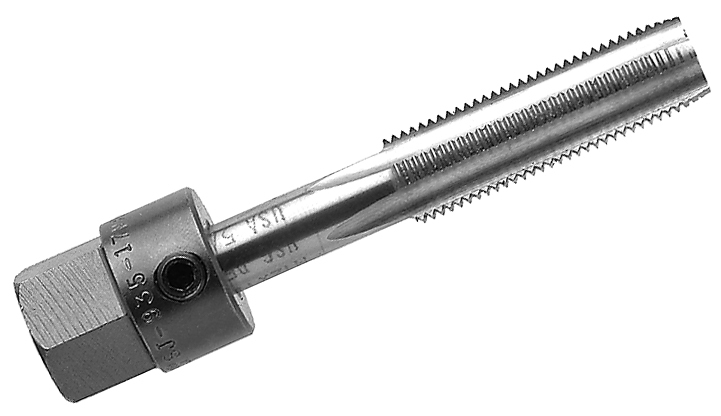 Tap Size: 1/4'' Male Hex Size: 7/16'' Socket Length(in./mm): 15/16''/ 24mm Socket Diameter(in./mm): 5/8''/ 16mm Quantity discounts may be available for the SJ-935-1/4 Apex Brand Taping Holding Socket, Male Hex Drive. Please contact MRO Tools for details.